I always thought Wesley was all right. I mean, I guess he is kind of annoying, but oh well. 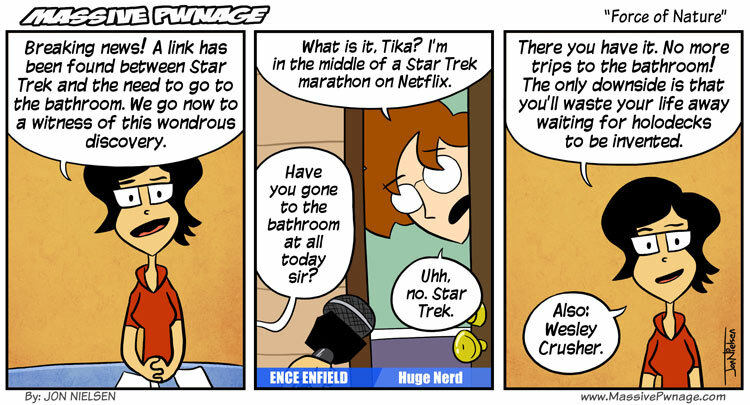 The last couple of weeks have been pure Star Trek for me. After watching a ton of it on Netflix, I went and busted out a bunch of my old Star Trek computer games. Starfleet Command, Bridge Commander, Klingon Academy. This entry was posted on Friday, September 30th, 2011 at 12:00 am and is filed under Comics. You can follow any responses to this entry through the RSS 2.0 feed. Both comments and pings are currently closed. I couldn’t think of a title so I figured I’d go with an episode title. Then i figured, having to pee is a natural sort of instinct/force.